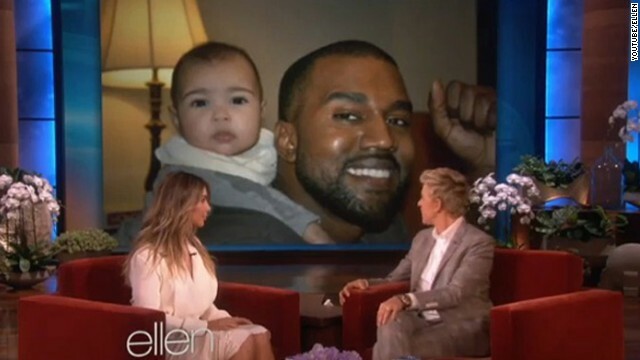 Between Kim and 'Ye, who do you think changes diapers? Both Kim Kardashian and her fiancée have reputations for being a leeeeetle high-maintenance, so we wouldn't be surprised if they had a diaper-changing specialist for daughter North. But in reality, mom Kim is actually really into the changing time she gets to spend with her daughter, as she told Ellen DeGeneres on her talk show. "(Kanye's) not a diaper-changing kind of guy," Kardashian said. "But he would, if it's an emergency he will. But I love that time, I know it sounds crazy, but I love that time with her. When she's on the changing table she tries to talk so much, and I really enjoy that bonding time when I'm with her." Don't mistake 'Ye's distate for diapers as disinterest, though. "He's the most amazing dad, he loves her so much," Kardashian said. "He really is a hands-on dad." Check out more clips from Kardashian's appearance below. The new season of "Keeping Up with the Kardashians" premieres Sunday at 9 p.m.
Next entry »Lifetime's 'Flowers in the Attic': What's the verdict? Ah jus murried a hansum black man ah met throo CNN. I am trying real hard to get through one day with out seeing this family, or hearing about them ... It is not possible! Try it ... not sure how they do this .. They don't have an education or any talent (K's family) yet they are all over the place.. How? You're right about no talent. It's amazing what the power of the v can do though. Who cares? I think the media is more interested in these 2 than everyday people. I wish they would stop already! Nobody gives a crap about what these 2 idiots do. Don't believe for one minute that this nasty piece of trash changes a diaper....you know they have 'people' to do everything. the speakers of sh!t have thread of dreams and no posts ? Little blockage going on ? she appears too finally be in a good relationship, good guy and her child. I wish them all the best! Good guy? Are you kidding? This guy has been a tool since he stormed the stage and ruining someone's moment to shine during her award speech. He's a ding dong and hopefully someone takes this fool out soon. I hope this roach get the life sucked out of him soon. He really is useless to society. Kanye probably refers to himself as the Steve Jobs of diaper changing. Great last line. Anyone connected to this family is a zero though shine-ye has been a zero for a long time prior to sinking the dink in the dumpster. @ Tandy Dude is starting to look like a white Michael Jackson. We had Kim's diapers custom made from 5 yard sections of the finest red crushed velvet. I'd heard she was gonna be on Ellen, so I wanted to see how she looked. That girl has an azz the size of the Grand Canyon! All those "selfies" of her had to photo shopped. So, she changes her daughters diapers....that's not really news, is it? The big question, the one the world really wants to know is who changes Kanye's.